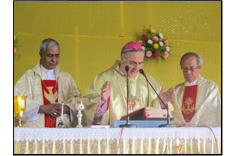 The Archdiocese of Guwahati has the territory consisting of 9 districts — Kamrup (Metro), Kamrup (Rural), Goalpara, Nagaon, Morigaon, Hojai and Tamulpur sub- division of Baksa — of the state of Assam. Guwahati, the ‘gateway’ to Northeast India, is the first place to be associated with Christianity in the region. Two Portuguese Jesuit Missionaries, Cabral and Cacella— the first Christian Missionaries to set foot in Assam—reached Hajo and Guwahati on September 26, 1626. They were enroute to Tibet from Hooghly. In June 1850, Fr. Robin, Fr. Krick and Fr. Bernardi of the Institute of the Foreign Missions of Paris reached Guwahati. Fr. Robin tried to learn Assamese and establish a centre at Bongnia. Fr. Krick proceeded to Nagaon and from there to Dibrugarh with the intention of going to Tibet. In 1854, Fr. Krick and Fr. Bourry were killed in the Mishmi Hills while trying to enter Tibet. Fr. Jacopo Broy of the Institute of the Foreign Missions of Milan took up residence in Guwahati and built a brick church here in 1883. From this central place he looked after the entire ‘Assam Missions’. Soon we find him in Nagaon where he later built a small church. In 1889 the Prefecture Apostolic of Assam was created with headquarters at Shillong and was entrusted to the German Salvatorian Fathers. In February 1890 the German Salvatorian Missionaries Frs. Gallus Schrole and Rudolph Fontaine reached Guwahati. They were the two great missionaries of the Assam Valley. By this time many tribal Catholics from Chota Nagpur had come to work in the Tea Gardens of Assam. With the outbreak of World War I, the German Salvatorian Fathers were forced to return to their country. The Jesuits of Kolkata looked after the Assam mission till the Holy See entrusted it to the Salesians of Don Bosco in 1921. In 1922, the Salesians of Don Bosco arrived in Northeast India under the leadership of Fr. Louis Mathias. In 1923, Fr. Leo Piasecki took charge of the Mission in Guwahati which at that time covered the entire Brahmaputra Valley, Nagaland and Manipur. Assam Mission then consisted of the whole of Northeast India. Shillong was the capital of undivided Assam. 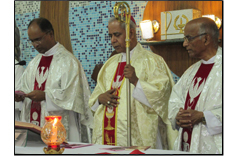 In 1934 when Shillong was made a Diocese, Msgr Louis Mathias SDB was appointed as its first Bishop. Msgr Stephen Ferrando succeeded him in 1935. From Guwahati missionary work reached out to Dibrugarh, Tezpur, Garo Hills and Bhutan. Some of the first Catholics of Manipur and Nagaland had studied at Guwahati. 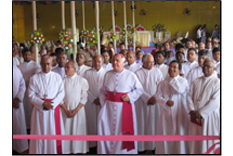 The Diocese of Guwahati was erected by Pope John Paul II on August 16, 1992 with Bishop Thomas Menamparampil as its first Bishop. 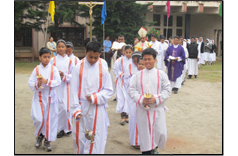 It was carved out of the Dioceses of Shillong, Tura and Tezpur, the last contributing the largest portion. It was elevated to the status of an Archdiocese on August 1, 1995 bifurcating it from the Ecclesiastical Province of Shillong. The suffragan Dioceses are Dibrugarh, Tezpur and Diphu. Dioceses of Bongaigaon, Itanagar and Miao, erected later, also form part of the Ecclesiastical Province of Guwahati. The area of the Archdiocese covers 13,961 Sq.km with a population of approximately 7,347,961. A Catholic population of 53946 is spread over 44 parishes/Centres. 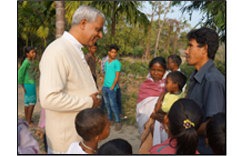 Catholics are mainly from the tribal communities: Garos, Rabhas, Bodos, Karbis, Tiwas, Santals and Adivasis.